"Congratulations Juliet! Now that you have won the All Things Dog Blog FETCHING FIDO title, what are you going to do? "Woof, woof!" Oh, so you're going to go to the dog park? "Good for you! That's where Oliver would want to go if he won a photo contest. Can he meet you there? Have fun, Juliet. We love you!" Good morning All Things Dog Blog readers, and welcome to the announcement of our Fetching Fido photo winner. Isn't she adorable? 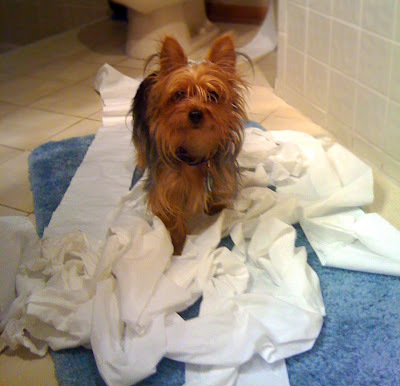 According to mom, "Juliet had a joyous time making mischief with the toilet paper", as she streamed it across the floor and back, emptying the roll. She certainly is creative in her playtime adventures. doggies are having a better afternoon after that strenuous play time." Second place in the FETCHING FIDO contest will be announced in my next post. This lucky pup will win a kong, along with his photo on the blog. Photos receiving honorable mentions (to be defined as just about all other photos; I'm a sucker for most all dogs!) will be used as the headline photo in upcoming posts. The lucky "Rover's" name will be included, so be sure to watch for your darling's image in an upcoming post. You can be sure not to miss it by subscribing to email delivery of my posts above in the right hand column. Don't worry; I won't sell your email address or give it to anyone. Scouts' honor. We sure would enjoy a video of Juliet and Tebow in their afternoon romp--hint...hint!